Quiet character video has some of those, too. Battleborn's open beta has ended, leaving just one big event on the horizon: release day! The game is set to launch on May 3 for PS4, PC, and Xbox One, and this launch trailer will remind you why you and your co-op buddies should call in sick this Tuesday. Launch trailers are the high school pep rallies of the video gaming world. They feature lots of noise, lots of flash, and if you're lucky, a few seconds of content. 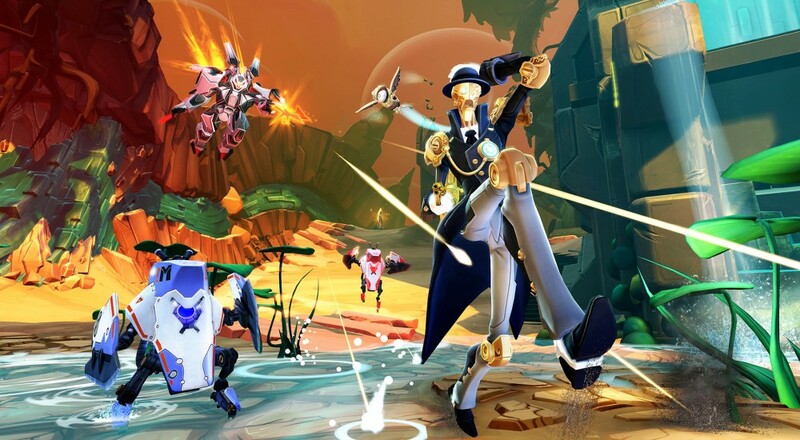 The 90 second spot for Battleborn follows that template to the letter, pushing the game's more colorful aspects alongside co-op and solo play. If gameplay is more your cuppa, another official video showing off one of the game's 25 characters will give you your fix. Deande is a melee based stealth character whose abilities let her dart in and out of combat to deal massive damage. She can spawn a clone of herself to confuse foes, cloak, and dash towards enemies to unleash a power slash. Although most of her attacks are close range, she's not exactly a tank, forcing you to play strategically and put those sneaking skills to good use. Battleborn is on its way to Xbox One, PlayStation 4, and PC May 3rd. All versions support online co-op play for up to five people. The console versions also support two player local splitscreen play. Page created in 0.2825 seconds.